Fort Lauderdale Real Estate is considered the venice of the United States with all the waterways. 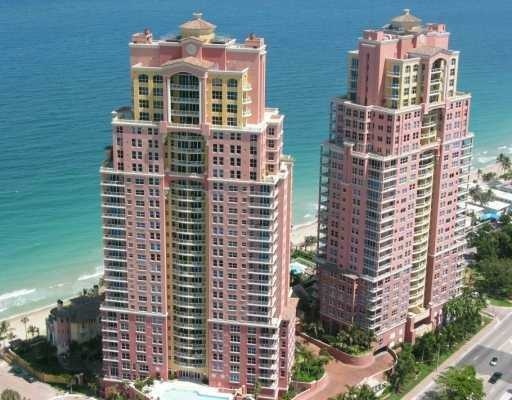 The Palms is located on the north end of the main Fort Lauderdale Beach district. Read more about The Palms. The Palms is a boutique community located directly on Fort Lauderdale beach with 192 residences including condominium units and townhomes. The Palms has a mediterranean flare with breathtaking views of the ocean, intracoastal waterways and skyline of the city of Fort Lauderdale. A pampered lifesytle awaits you at the Palms with 24 hour valet parking, full beach and pool service, fitness facility, racquet ball, squash and tennis. The Palms ammenitites include a lushly landscaped heated pool and spa with cabanas, sauna and steam room, massage, aerobics room and meeting and entertainment rooms. Eric Miller and Asociates, are always available to help you buy or sell real estate in the area and will be happy to show you The Palms. You can Contact us directly at (954) 383-8170.